Electrochemical water splitting is favorable strategy to produce high-purity H2. The current mainstream catalysts for water electrolysis are precious metals (Pt, RuO2, IrO2), which possess superior catalytic activity, relatively low over-potential and favorable catalytic kinetics, but their high cost and poor cycle stability is still unaffordable. Therefore, it is urgent to develop a new type of hydrogen production catalyst with low cost, high catalytic activity and high stability. Due to its low cost, high abundance, and good electrical conductivity, the transition metal-Co and its derivatives have shown great promise in electrocatalysis. However, stability has been a big issue due to their high chemical activities. To address this issue, encapsulation of Co nanoparticles into carbon shell has been proposed as an effective strategy to inherit the high electrocatalytic activity of the transition metal, and further prevent its corrosion from the harsh electrolytic environment. By tuning the metal composition and structure of carbon layers, the catalytic properties of these composites can be regulated. 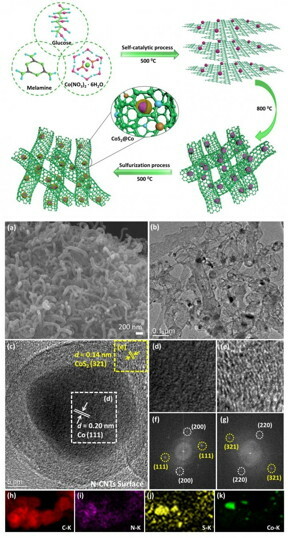 Recently, Liu Zhao-Qing's group of Guangzhou University reports a bifunctional catalyst, transition metal cobalt ions induced the self-growth of nitrogen doped carbon nanotubes, which are further vulcanized to incorporate sulfur into the carbon nanotubes framework. The obtained materials (S, exhibit excellent HER and OER performance. As cathode and anode, S, can rapidly dissociate water molecules to produce hydrogen and oxygen gases, requiring only 1.633 V to reach a current density of 10 mA cm-2, and a strong stability under various operating currents is also observed.